Remember on Monday when I told you I went skillet crazy? Well, this was the first dish I made that day. The big dutch baby, oh yeah! This is one of the easiest pancakes you will ever make. I mean it, it’s so easy, easy peasy! It’s a one-dish pancake and who doesn’t like that? I’m calling the dutch baby a pancake for simplicity sake, but it’s not really a pancake, it’s less cakey, lighter and spongier. It actually is more reminiscent of a crepe in its taste and texture. We all like to treat ourselves and kids to a fun breakfast on the weekend but who wants to slave over a stove flipping pancakes, not me. I would rather throw something together, relax with my cup of coffee and let the oven do the work. Sound good to you? This is the perfect pancake for sleepovers or any large breakfast gathering. You can serve a lot of people with minimal effort and everyones jaw will drop when you pull this puppy out of the oven. It’s fun because it rises differently every time, almost like popovers. Don’t fret when you look in the oven and see this huge monstrosity; it deflates a bit when you take it out of the oven. The other great thing I love about this breakfast is that the ingredients are basic and you don’t have to bring any eggs or butter to room temperature. 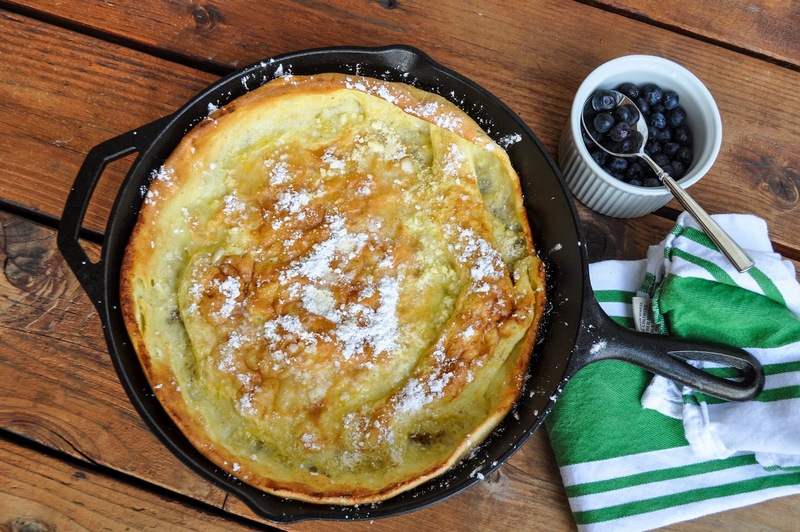 I made my dutch baby in a cast iron skillet but it can be made in any oven-safe dish such as a pie dish, square or rectangular glass baking dish or even a roasting pan. 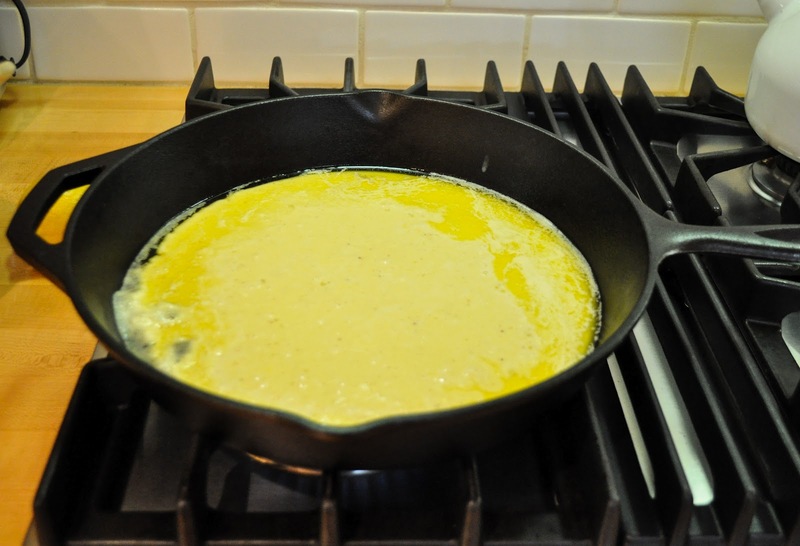 So you don’t need a cast iron pan in order to make this for breakfast say, TOMORROW! You are going to make this for breakfast tomorrow, right? Haven’t I enticed you yet? serve it in a smaller pan. I used my 12-inch cast iron for this recipe. Below are all the ingredients you will need (see I told you it would be easy)! Preheat your oven to 425 degrees. Whisk your two eggs together. 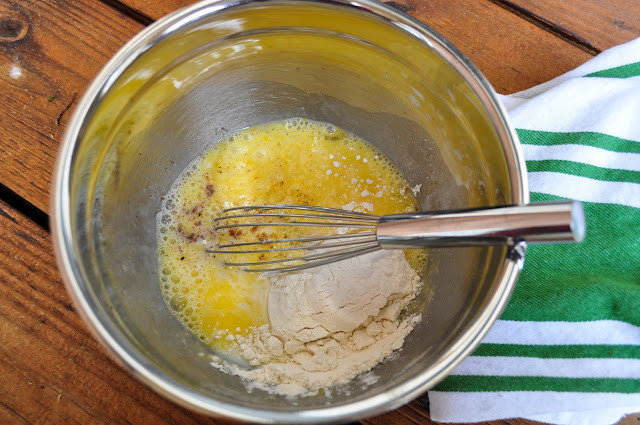 Add the flour, milk and nutmeg to the eggs. Beat lightly. 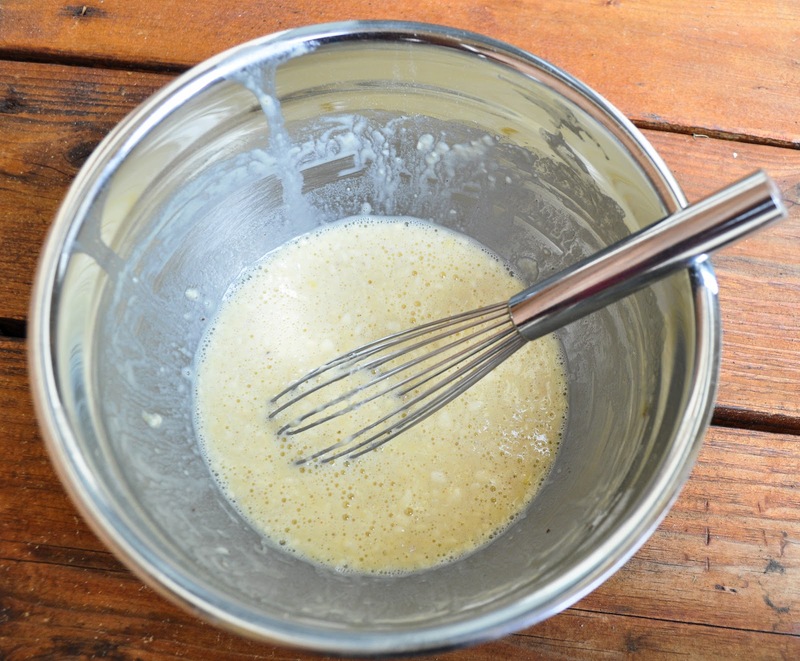 Leave the batter a little lumpy. 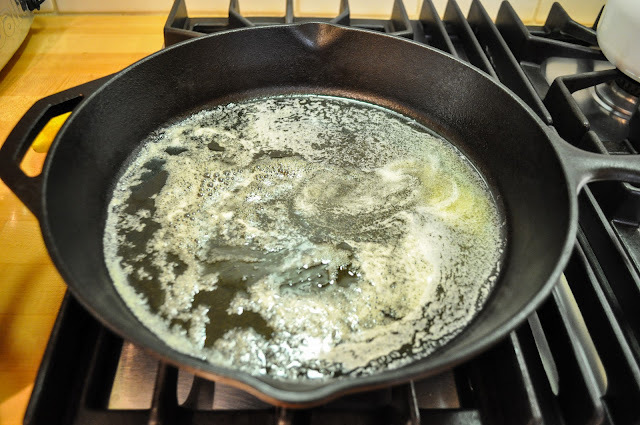 When your oven is preheated, melt the butter in a 12-inch skillet (or oven safe pan of your choice) with a heatproof handle. When the pan is very hot and the butter is melted, pour in the batter. Put the pancake in the oven and bake for 15 to 20 minutes, until the pancake is golden brown. Sprinkle with the confectioners’ sugar and return briefly to the oven. 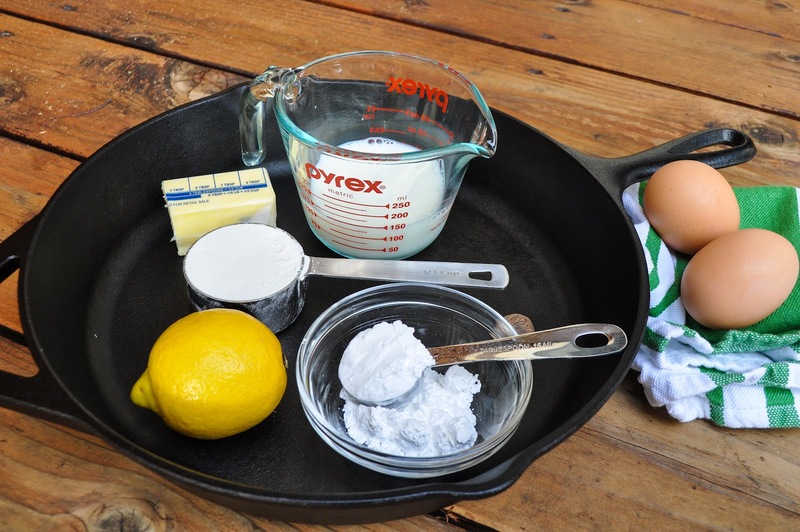 Remove the pancake from the oven and sprinkle with the lemon juice and top with more of the confectioners’ sugar if desired. 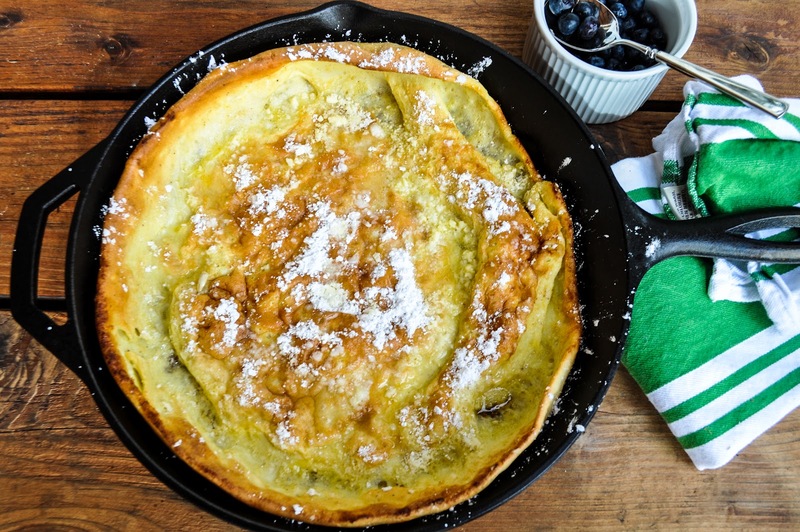 The pancake tastes absolutely perfect with just the confectioners’ sugar and lemon, but you can jazz it up a bit by adding any fresh fruit of your choice. The cool thing about dutch babies is that you can play around with them. Just serve them up and let people have fun with the toppings. You can make large ones for people to share, or smaller individually sized ones. Zoe is not a fan of this with the lemon on top, so I give her a piece before I squeeze the lemon on it. Eli loves it with the lemon! If you’re looking for another amazing breakfast treat with a “wow” factor, try these sugar crusted popovers. They will literally melt in your mouth they are sooo good! Do you have any easy breakfast treats that you would like to share? If so, feel free to comment and add a link! Spread pumpkin butter all over and have a great fall breakfast. Wow. Hi there! I’m so glad you loved it! Hmmmm…. 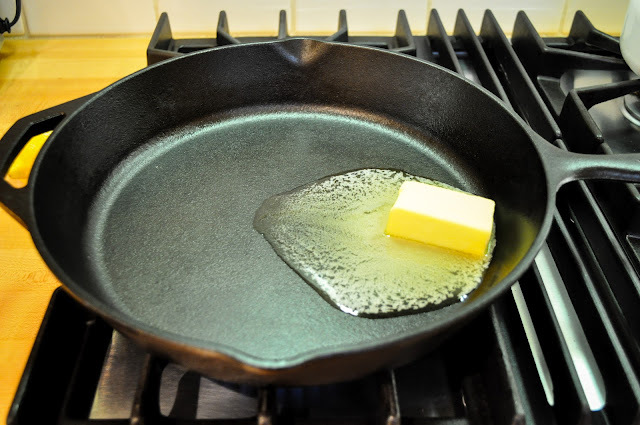 I’m not sure how it would be with less butter. You could give it a shot and see? When it comes to baking recipes, I usually stick to the recipe. I’m a wimp that way 😉 I’m so glad you’re loving the blog. Have you tried the sugar-crusted popovers? OMG, those are my absolute fave! If you do try less butter next time, let me know how it turns out for you. This is so easy to whip up! Woke up this morning and my kids wanted something other than the usual options. Remembered this recipe from way back and had all the ingredients on hand. Paired it with toasted almonds and raspberries…..SO good! Kids loved it! I came across your blog (love it btw) this morning and thought I’d give these a try. Despite the fact that mine turned out hollow, not gooey, they were still delicious. I’m not sure what I did wrong, this is my first experience with popovers and I’m infamous for not being able to follow a recipe! They were still a big hit, my kids were silent until the last bite! Hopefully I can recreate my mistake. Thanks for sharing! Oops..I must have hit the back button by mistake. This comment was supposed to be on the sugar coated popovers! Sorry! Popovers are honestly a tricky thing. Sometimes mine even come out too gooey or not gooey enough, they are picky little things and have a mind of their own. My kids were talking about these the other day and asking when I was going to make them again. I think these are going to be in my morning breakfast plans tomorrow. Please let me know if you have any other questions Sarah! Greetings, Jackie! I’ve nominated you for the Versatile Blogger Award and the Very Inspiring Blogger Award! I really enjoy your blog and wanted to share it with the world! Wow, thanks Andrea, you made my day. I just linked over and saw the kind and amazing words you wrote about me! You rock! 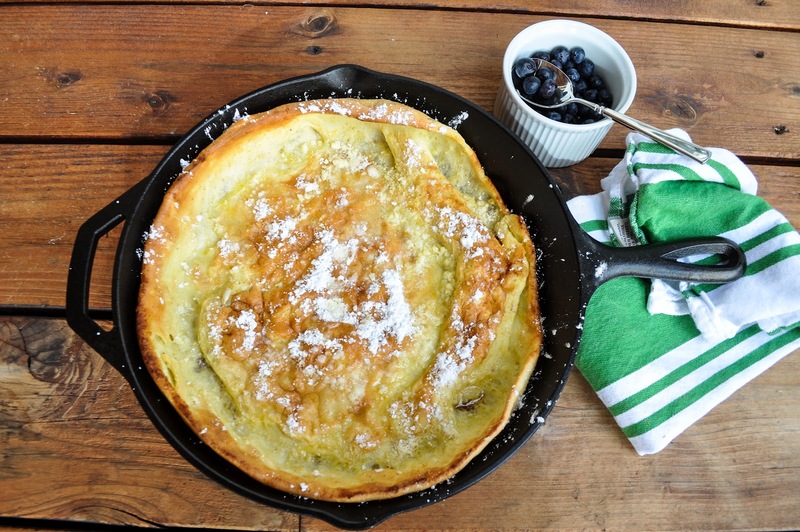 You can’t beat a big Dutch baby… it looks PERFECT! I am so glad you are getting my feeds again. Moving a website is a pain!!! Hi Em! That sounds amazing. I love french toast and I actually make it with challah bread! This also looks so good. My current favourite lazy weekend breakfast is french toast made with sourdough bread… so yummy! !